Remember this thread? I was browsing all over when I saw that this Hot Lap weekly challenge is still alive. I had to try to see if I was able to beat the best racing time of the current challenge. It is at Autopolis GP using either Porsche Carrera GT or Lamborghini Reventon setting a fast lap. Fastest time was a 1.43.39 using the Carrera GT - and that time is easily beaten - I did 1.41.805 after 10 min. Sadly the challenge ended today, but I will upload it and respond just for the fun of it. It seems that there is one particular guy winning almost every challenge, and I thought perhaps some of us could participate and show that there are still fast players playing Shift. Also nice with some change from PBRC´s for those getting a bit tired of that. 2slow has submitted a 1:40.19, firefly a 1:40.79. Ohhh I did not see that....I forgot something about this challenge - it ought to have wrclient to verify peoples claims if done using a PC. What about suggesting that to NFS? It is just too damn easy for people to be cheating if they want to win a challenge like this. 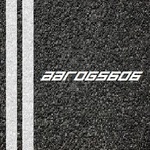 A guy gets credit all over from NFS - are they idiots? Lol, ive been working on setup for the Corvette lately and there is no way its faster than the Zonda or LP640. Ive got the Vette handling good, but its just not fast enough and ive tried at least 20 different gearing combos. The guy that used to win these was Anak (mrkingrawana at youtube). He also posted some very fast videos at youtube, but I havent' seen any activity from him in a long time. 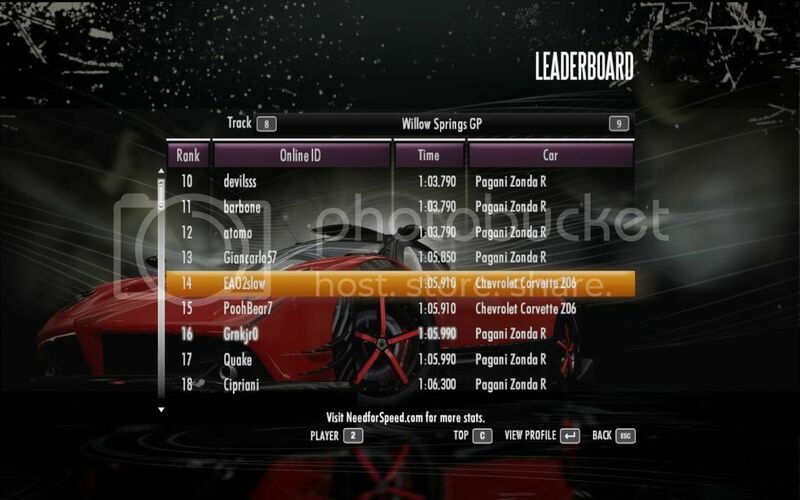 Thank you for that link and I sure did ask him to prove his run of week 26 at EA Shift´s Hot Lap Challenge on Youtube, where he did an incredible 1.05.910 on Willow Springs GP using the Corvette Z06. I asked him to do a similar time with wrclient software running. What I don´t understand is why his time of week 26 has not been questioned earlier? I've been convinced that NFS Shift doesn't play the same on all PC's since I watched Anaks (mrkingrawana at youtube) videos and comments posted at NFS Unlimited back in October - November 2009. This could be yet another case of the same thing, or a stats bug. ...if that had been here at ISRC he would have been forced to prove his times or else he would have been kicked out like others have been forced to in the past. What bothers me the most is the fact that he did not even respond to my last question - but I guess that just explain a thing or two about this person and his driving skills and lack of manners. At the end of the day, only EAO2slow knows the real truth of it. My personal opinion is that he seems to be doing an awful lot of tap dancing, and that doesn't give one any confidence. Here is a video of my response to NeedForSpeed´s Hot Lap Youtube challenge. I managed a 1.13.450 using Viper on Ambush Canyon, which I think is all right. I think maybe a 1.13.200 can be done using the setup I use, but I really am tired of doing that track trying to improve. Good thing is that I am now able to beat most players online on that track, which really was a track I used to hate a lot - now I like it. Just wondring what this is and have u done the same?